Pedigree showing some of the classic features of a family with a deleterious BRCA1 mutation across three generations, including transmission occurring through maternal and paternal lineages. The unaffected female proband is shown as having an affected mother (breast cancer diagnosed at age 42 y), female cousin (breast cancer diagnosed at age 38 y), maternal aunt (ovarian cancer diagnosed at age 53 y), and maternal grandmother (ovarian cancer diagnosed at age 49 y). BRCA1 pedigree. 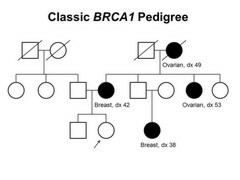 This pedigree shows some of the classic features of a family with a deleterious BRCA1 mutation across three generations, including affected family members with breast cancer or ovarian cancer and a young age at onset. BRCA1 families may exhibit some or all of these features. As an autosomal dominant syndrome, a deleterious BRCA1 mutation can be transmitted through maternal or paternal lineages, as depicted in the figure.